White Coat Waste Project Has Secured a Federal Audit of Uncle Sam’s Cruel, Secretive & Wasteful Labs. This is Fantastic News! Citizens are actually able to use their rights as citizens to uncover and correct what is wrong and unjust. Innocent animals are being tested on by government funded educational institutions, medical associations, drug companies and they are all funded with tax payer dollars!!! That’s your money that is disfiguring, genetically bringing animals into the world with incurable diseases, and many times for nothing at all. They have to do something, so these monsters make up reasons to test on dogs, cats, mice, rats, chimpanzees, rabbits and whatever else they buy from breeders that do nothing but breed animals for the soul purpose of selling them to laboratories. It’s a symbiotic gravy train with the fuel being supplied by the government, read, your hard earned money! Live pigs being shot, have limbs cut off, critically burned, cut open and have their insides ripped out. All done by our US military for training, when there are better ways to train with lifelike models of human beings. White Coat Waste Project has secured a Federal Audit of these monsters!!! It looks like their “gravy” is about to run out! Nothing could be more patriotic than that! Why is it that this has never happened before now.? For sure, one reason is there was never a White Coat Waste Project. Can you think of an administration before our very unique present administration, that grassroots concerns were addressed? I certainly can’t. The twist is the Democratic party used to be the one that stuck up for America’s citizens and what their grass roots concerns were. Now, all those people have taken up permanent residence on the left and right coasts and prestigious waterfronts in between. They live in ivory towers, just like our uppity college professors. They talk about making things right, but very few actually do anything. Three cheers for Anthony Bellotti and his White Coat Waste Project Team! Get all the facts below! Politico is now reporting: we’ve successfully secured the first federal auditof Uncle Sam’s secretive and wasteful animal labs! This is the strategic break we’ve been waiting for. That’s what the Washington Post reported after we took our “Spending to Death” investigation to a powerful bipartisan congressional delegation. On your behalf, we rallied them to audit this senseless waste and abuse. But now, thanks to you, all that is about to change. The GAO is now conducting the first audit of spending on animal testing ever! This breakthrough couldn’t be more timely — or more urgent. It’s less than one month after our team first exposed the USDA blackoutscandal to the New York Times, Associated Press and national media. The most important thing you can do to hold these government labs accountable is RUSH an immediate contribution to support this campaign. And a generous new supporter of the audit will DOUBLE your donation to help us meet our end of month budget deadline in the next 48 hours. Let’s intensify this audit campaign and hit the government’s animal abusers where it hurts most: their bank accounts! P.S. It’s official: the GAO has “green lighted” the first audit of government spending on animal testing! That’s why the most important thing you can do right now to hold the animal abusers accountable is to rush an immediate contribution in support of our historic audit campaign. For a limited time, a generous benefactor will DOUBLE your donation to help us raise $150,000. Please make a tax-deductible contribution against taxpayer-funded animal experimentation now. 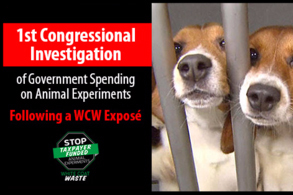 White Coat Waste Project is a 501(c)(3) bipartisan coalition of 350,000+ liberty lovers and animal lovers opposed to the government’s wasteful spending on animal experiments. Our mission? To stop taxpayer-funded animal experiments. National Review calls it a “refreshing consensus-building argument.” Our work has been profiled by Washington Post, Science, US News & World Report, Fox News, Huffington Post, Washington Examiner, TheBlaze, RedState, and Daily Caller. Contributions are tax-deductible. Author Justamis2015Posted on February 28, 2017 March 3, 2017 Categories Animals in the NewsLeave a comment on White Coat Waste Project Has Secured a Federal Audit of Uncle Sam’s Cruel, Secretive & Wasteful Labs. – Share this news segment, and ask your friends to sign the petition to Safeway! A few weeks ago, I sent you the story of a little hen named Scarlett, rescued from being crushed to death at a “humane” Safeway farm. Well, I’ve got AMAZING news: ABC outlets in over a dozen major media markets aired Scarlett’s story today as part of a broader exposé of the egg industry. Millions of Americans will now see the terrifying reality of cage-free eggs. We made this happen together. We have no press budget, so mainstream media picks up our stories when they see us trending in social media. And because of you (and activists like you across the world), ABC flew a crew all the way to California to capture our latest. Scarlett made it back from the brink of death, but miracles like that are impossible without you. Let’s keep pushing until the entire world sees the truth: suffering animals need to be rescued, not used like machines! You received this email because you opted in on our website or signed a petition. Click here to unsubscribe. BREAKING: ABC News walks with DxE as we rescue a dying bird from a cage-free farm. You won’t believe the industry’s response. Wayne Hsiung There is power in rescue. The scene of Ashley Sloan rescuing a poor bird is so beautiful. The team that executed this investigation was amazing. Direct Action Everywhere Great job to the incredible team! Thanks for taking Scarlett’s story to the world and exposing the cage-free lie! Arwen Carlin Thank you, Direct Action Everywhere for exposing the truth. Even the hens they showed with the family have serious reproductive issues because they have been genetically engineered to lay so many eggs. Not to mention, all their brothers were ground up alive the day they were born. There is no humane way to exploit another animal’s reproductive system. Direct Action Everywhere Thank you Arwen! You’re exactly right! No humane way to exploit someone! Walter Becker Please do not fool yourselves everything in the food industry is based on lies, they want to make money. They do not honestly care about animal welfare as long as they get away with it. Kitty Jones I’m so glad this got coverage! Even beyond what she saw on the farm itself, there is also immense suffering before and after the hens arrive that these awful places. from hatchery to slaughterhouse its all violence and oppression. Everyday the truth is coming and those who profit from animal suffering are having to defend themselves like never before! Steve Erlsten In their follow-up, ABC talked to Dr. Darrin Karcher, whose career centers around promoting exploitation of hens and turkeys. Dr. Karcher says “from a science standpoint, there is nothing there that I am aware of that would allow us to say the birds are happier in this type of system versus” caged egg production. When animals’ well-being compete with profits, the profits always win.